Airports might not be one of the many favorite place of many travelers however, you can exclude Changi Airport in Singapore from that list. Changi Airport has been famous as one of the famous airports in the world that showcases many beautiful and interactive attractions for all their guests. 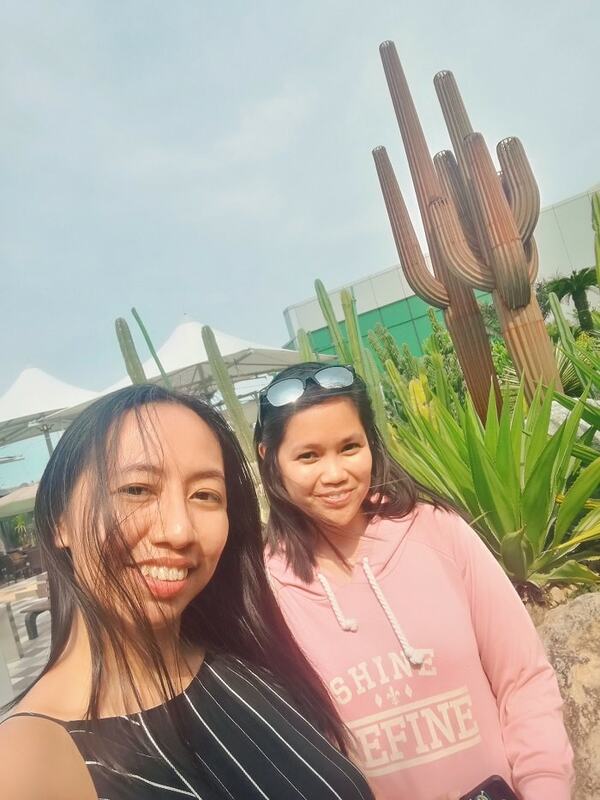 During our recent layover in Changi Terminal 1 bound to Bangkok, Emily and I had an opportunity to visit the famous Cactus Garden. And you will be amazed how much they maintained it beautifully! It was 3:00PM in the afternoon of Monday when we decided to pay it a visit while waiting for our next flight to Bangkok. 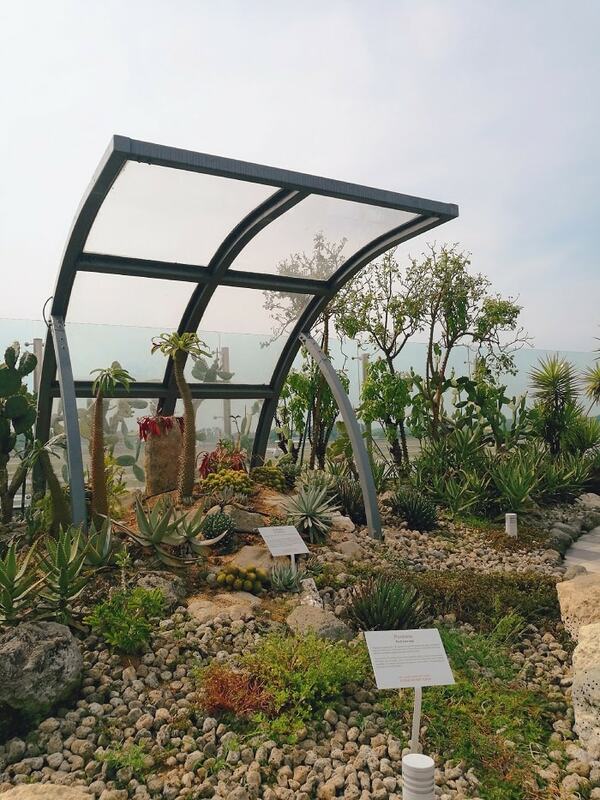 The Cactus Garden houses more than 100-species of cacti and arid plants from the desserts and dry areas of Asia, Africa, and America. 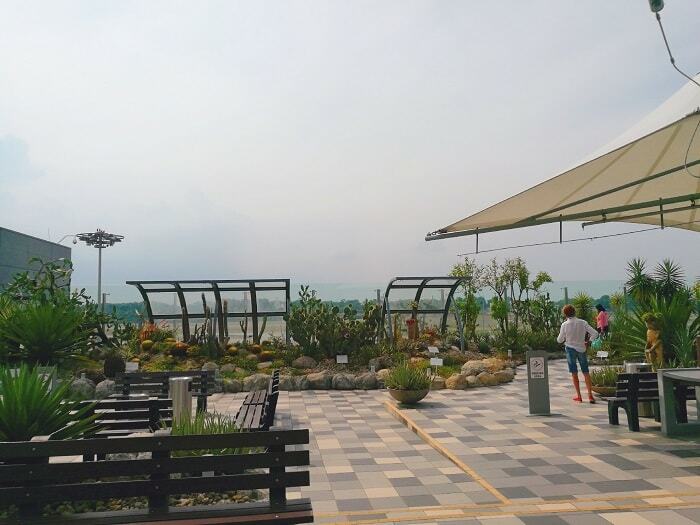 This roof top garden is famous for many tourists and guests to enjoy the sun, while watching the plane coming and going, and also one of the place that is a huge relief for many smokers. Apparently, this is one of the few places in Changi where smoking is still allowed. There is a bar and coffee shop on the rooftop, which is perfect while enjoying this beautiful view. 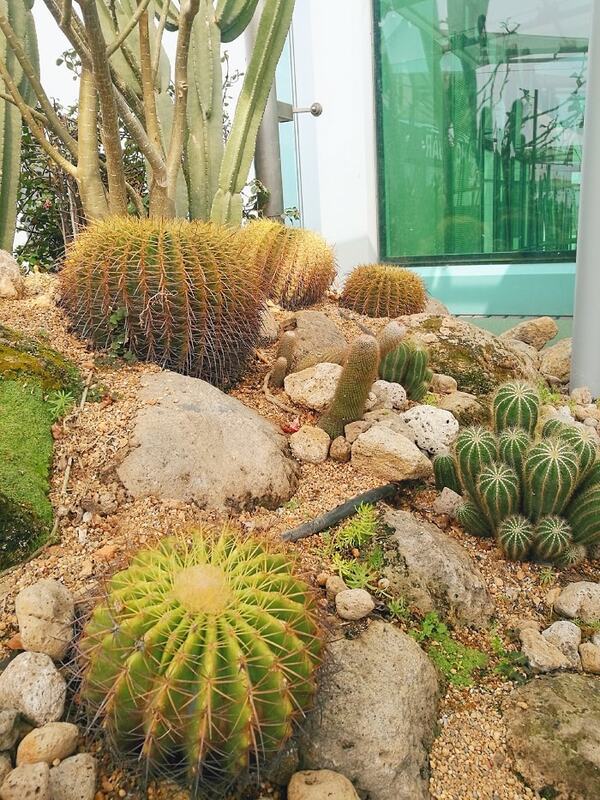 These cacti contributes a lot in making this part of the airport eco-friendly. Cactus are known for absorbing carbon dioxides, and making the air fresh and clean, and these little fellas can survive longer without water. 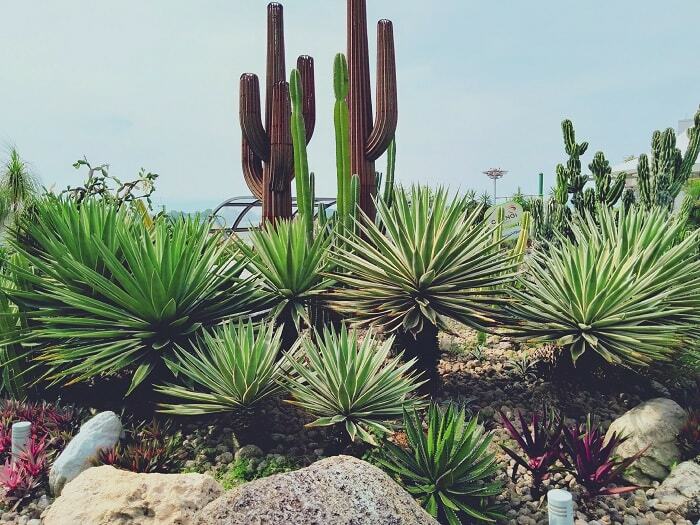 Notable plants featured in the garden include various forms of Cycads – a tenacious survivor of the dinosaur era – and other surreal plants like the Golden Barrel cactus, Oldman Cactus, and the giant Ponytail trees. 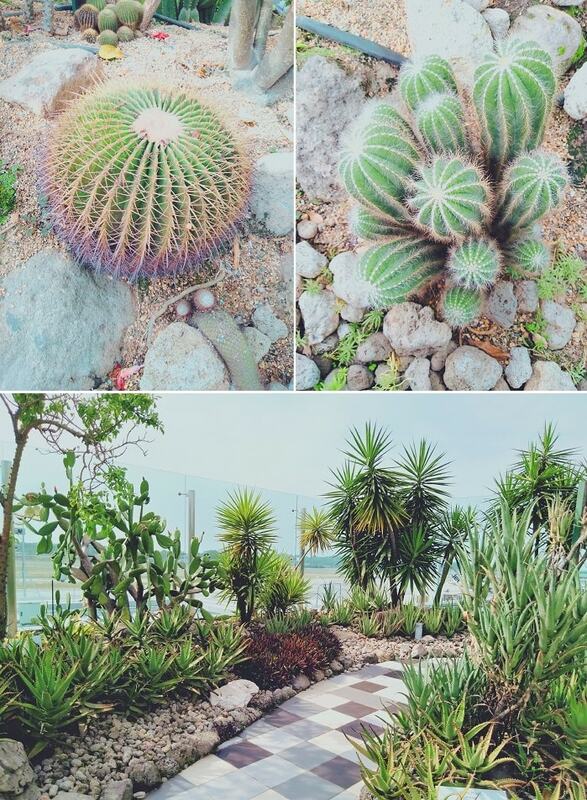 You can also see some edible apple cactus and prickly pear cactus and other economically important arid plants from different parts of the world. It is amazing that the Changi Airport Management decided to put this beautiful garden on their rooftop and have their visitors enjoy it. You see, airport pollution isn’t good for all and having this little place to help absorbs those carbon dioxide is very lovely. Having a little garden place makes this airport very welcoming to all their guests. How I wish that our international and local airports in the Philippines would apply this concept, and I think it would be that so hard considering my country is composed of thousands of islands having various species of plants. A strong collaboration with our environment agencies and air transportation management would be a great effort to realize this dream. How nice it would be to showcase the Philippine’s many plant species for many travelers every day! Also it would be a great tourism promotion to encourage travelers to visit these many provinces where our local plants and vegetation grows. Access is free for all and taking pictures are encourage. 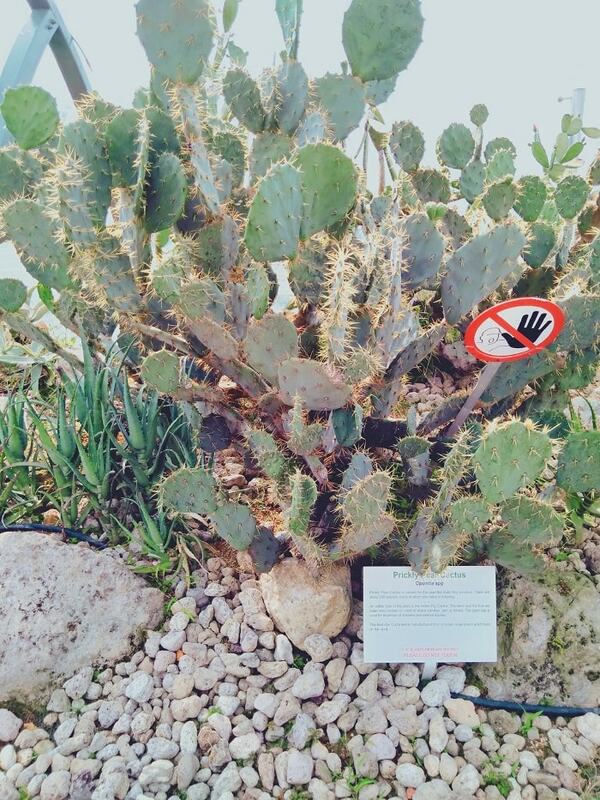 However, you should never dare to pick these cacti and put it inside your luggage, or sneak under your hoodie unless you want to end up having a long vacation in Singapore jail. This garden is well equipped with surveillance camera. Having some souvenir photos and videos are enough, so please don’t abuse the generosity of Changi Airport. 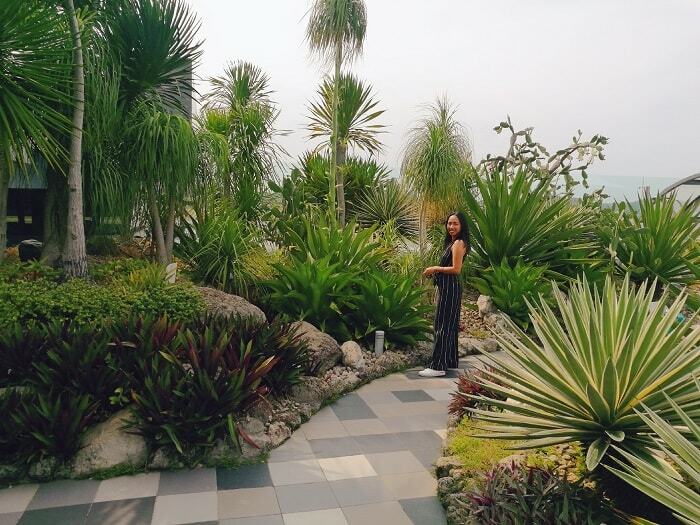 If you like this garden, you are free to share #ChangiExperience to your friends and family using your social media. We just had a short layover in Changi Airport, and hope we can stay longer on our next girl trip. …until our next Singapore trip! I've been to Singapore once but we did not explored the airport. Next time that we visit we'll check out this cactus garden. 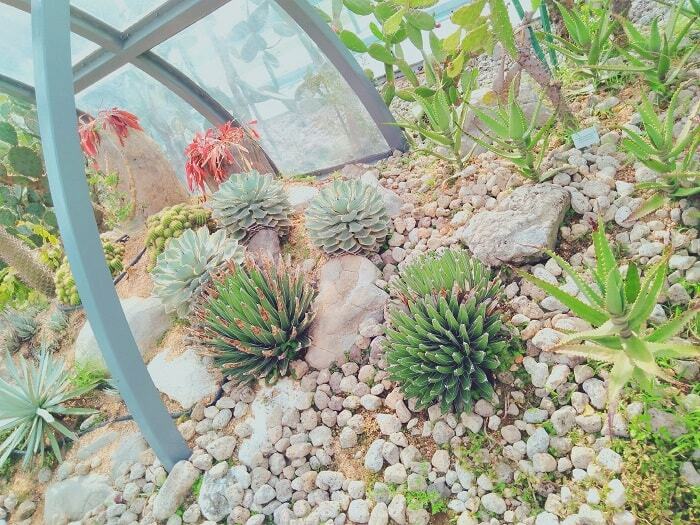 yeah you should check this beautiful garden! Which terminal had you stopped-by? I believe that we can also have this kind of garden in the airports here in the Philippines. If only the airport crimes here are not that rampant, the management can give their attention to beautification of our airports. We actually have more potential to have this even to the ne airports around the country. One particular airport that got huge potential is the new international airport in Bohol, which have quite a little resemblance with Changi Terminal 1. I've been to Singapore a few times but I never had the chance to explore the whole airport yet. It's amazing how they managed to make their airport a tourist spot already. I wish PH could also do that. This is what our airports are missing. We have thousands of shops, and malls and its tiring enough. We need gardens like this. 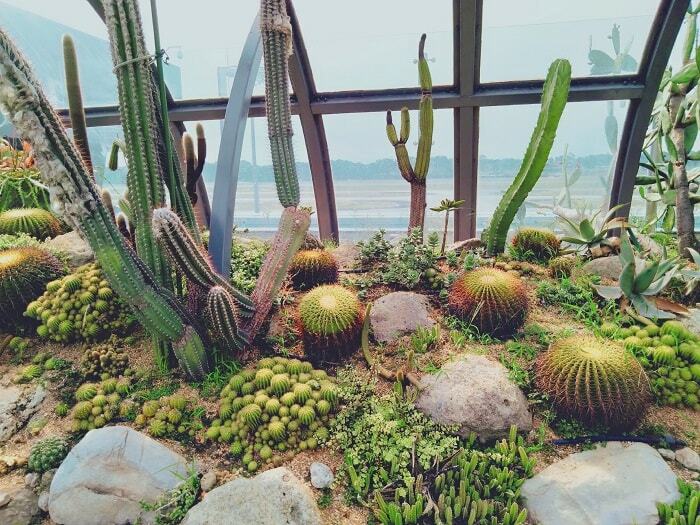 It's my first time to see a Cactus garden, and with the airport in Singapore, it seems that you won't run of activities and sights to explore while you are inside the airport itself, waiting for the next flight and layover. I hope more airports in Asia will adapt this eco-friendly venture. That's true. And Changi Airport excels in this department. Nakapunta na ko sa Changi Airport pero di namin nalibot. May ganito pala. Huhu sobrang ganda talaga nito! Sana makabalik ulit. There's a new attraction in Terminal 1 called Jewel Changi, an indoor oasis! grabe ang changi aiport sa ganda, tourist destination na rin sya no? Yes! That's why during long layover, it is nice to explore Changi! Yes you can. Changi Airport is not only a gateway but also a destination! Just like our NAIA Terminal 3, you can visit Changi even you are not going to travel. After all, you can't enter the departure area, unless you have a ticket. Heard great things at Singapore's airport and definitely this is one of the place to visit. Who would have thought they have that at their airport? Sana sa Pinas din. There's more actually, but we haven't got much time to explore. We will come back very soon!